SAN FRANCISCO, Nov. 7, 2017 /PRNewswire/ -- Nintex, the leader in workflow and content automation, announced the launch of Nintex Workflow on the Salesforce AppExchange, empowering businesses to connect with their customers, partners and employees in entirely new ways. Nintex Workflow for Salesforce is a powerful application that makes it easy for information workers to automate virtually any business process with clicks not code. This includes the ability to automate document-centric processes and spans organizations and systems. Built on the Salesforce Platform, Nintex is currently available on the AppExchange. Learn more at www.nintex.com/salesforce. With more than 7,500 customers worldwide, the Nintex Workflow Platform is the industry standard for automating, analyzing, and optimizing business processes to transform how work gets done every day. In addition to making sophisticated cross-cloud workflow capabilities available in the Salesforce Lightning user experience, Nintex brings modern forms capabilities to customers so they can easily build and design dynamic branded forms once and capture critical information across devices. Forms render elegantly on any device to ensure a consistent end-user experience and work online and offline, especially important for field service workers. Introducing the cloud-based Nintex Workflow Platform on the Salesforce AppExchange not only delivers new cross-platform process automation capabilities but it builds on the existing Nintex Document Generation app. 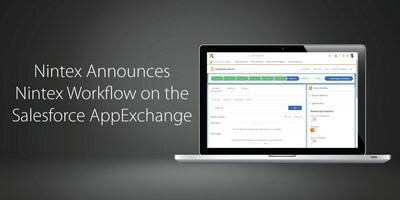 The app, formerly known as Nintex Drawloop, recently celebrated 10 years on the AppExchange and is ideally suited for use with content creation and collaboration processes, including the routing of documents for review and approval, sending documents off for e-signatures, or to support full document lifecycle processing. "Every enterprise has countless documents and manual processes that need to be automated as a critical first step in their digital transformation journey," said Aragon CEO Jim Lundy. "Over a year ago Aragon predicted that two traditional categories, BPM and CCM, would consolidate to create a new category, workflow and content automation (WCA), comprised of innovative technology vendors who can address this business need. Nintex is one of the leading providers in WCA for its integrated workflow capabilities with document generation, and for providing actionable insights through rich analytics. We're pleased to see Nintex integrating its platform further within the Salesforce ecosystem." "Everyone and everything is getting smarter and more connected than ever before, and companies are looking to transform the way they connect with customers, partners and employees," said Kori O'Brien, SVP, ISV Sales, Salesforce. "By leveraging the power of the Salesforce Platform, Nintex provides customers with an exciting new way to extend process automation for a variety of use cases including field service and sales operations." "Nintex is revolutionizing the way people work by building powerful software that is easy to use," said Nintex CEO John Burton. "With the introduction of Nintex Workflow on the Salesforce AppExchange, we've brought industry-leading workflow and content automation capabilities to users to make it fast and easy to manage their most important business processes in a trusted and familiar environment." "The value of the Salesforce platform is a combination of connectivity, acceleration, and consistency in process excellence," said Salesforce Vice President for Strategic Research Peter Coffee. "We're privileged to have partners who enable and empower Salesforce customers to combine portfolios of processes into transformational solutions." Coffee's comments relate to the extended partnership announcement between Salesforce and Nintex where the two organizations made a commitment in February of this year to provide seamless intelligent connectivity between their best of breed cloud platforms to support customer demand. Specifically, Salesforce customers expressed a desire to drive cross-platform, sophisticated processes including ones to automate contract lifecycle management, field service scenarios, employee onboarding and more.